All the makings for a summer shandy, seen here on my countertop. During the hot days of summer, mixing in a little juice or lemonade to your lager can be quite tasty. The English name for such a drink is a shandy. This calls for a light ale mixed with ginger, ginger soda or lemonade. 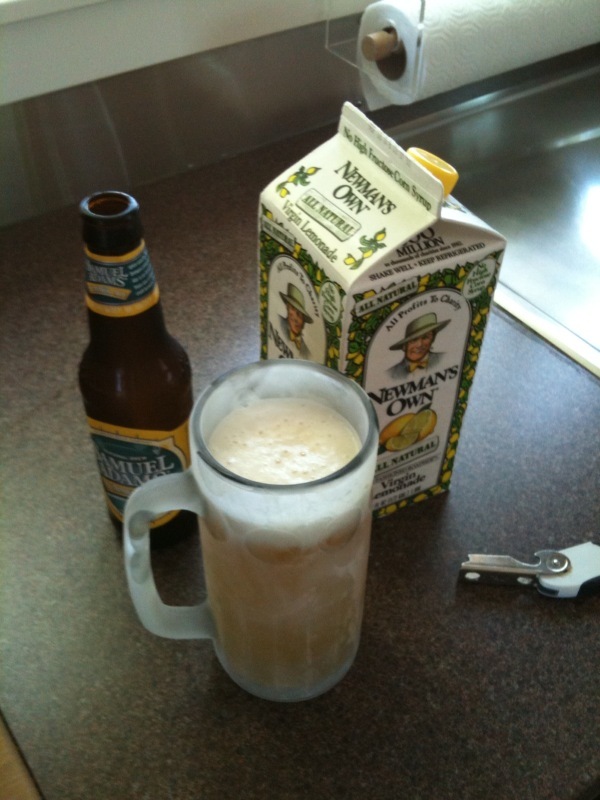 During the Fourth of July weekend I took a Samuel Adams Summer Ale, poured it into a frosty mug and topped it with some Newman’s Own lemonade. The resulting beverage was light, full of lemon zest and delicious. Using the right kind of beer is crucial. As you can imagine, mixing a dark Guinness with lemonade would taste terrible. In Germany the shandy is known as the radler, or cyclist, because the drink was first popularized by thirsty cyclers. In France, a mix of beer and juice is called a panaché. And in parts of Eastern Europe, drinkers will mix beer with Coke to make what’s known as a diesel. The last mix doesn’t sound good to me, but I can attest to mixing red wine with Coke. It’s not a fabulous drink in my opinion but I can understand that mix better than beer and coke. Maybe a darker beer would blend better with a Coke? I would recommend mixing with lemonade beers such as summer lagers, white ales or hefeweizens. Beers that you would normally drink with a slice of lemon. Such a mix is a great option for those who have to drive home from the weekend pool party because you can do a half-and-half mixture to reduce the overall alcohol. And try other juices and mixes like using cranberry juice or perhaps instead of an orange slice in your Blue Moon splash in a generous portion of fresh orange juice. Mixing up beer like a cocktail may seem strange, but this time of year it can be very refreshing.